Graphic designers are in high demand throughout the world, and for good reason. 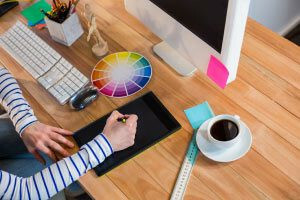 Whether you want to become a quality graphic designer, or just pick up some fun skills, this free graphic design course is for you. The course guides you through design processes, examining key design elements including line, shape, form and texture. This will quickly boost your graphic design skills and get you one step closer to designing Microsoft’s new logo. Graphic design is a skill with almost limitless uses. From designing company logos, to assisting architects, to creating beautiful art, the possibilities are endless. Almost every company in the world needs a graphic designer to turn their ideas into something people can see. This is a highly valuable and in-demand skill, which can be a great tool for career development. What’s more, it’s a fun ability that you can use to make really cool images! The course guides you through design processes and gives you a taste of what designers do in their day-to-day work. You will then learn the basic principles of design, covering composition, balance, contrast and hierarchy. The course then examines various design elements including line, shape, form and texture. By the end of the course, you will be familiar with the fundamentals of graphic design, and from there you can take your learning journey to wherever you want it to go. There are lots of people who have great ideas, but just can’t communicate what they look like. Graphic design is the key to getting those ideas out there. A picture can tell the story of a thousand words, and with this course you can be the person who can draw that picture. This is a powerful skill that opens up an in-demand and interesting career. So why wait? Start this free course today and get one step closer to designing Microsoft’s new logo. This course will help you to gain a good knowledge of using elements such as lines, shapes, forms, tones, textures, letters and colours in design. You will know the most important design principles that should be considered in a visual display. It will help you to understand paraline, orthogonal, isometric, oblique, planometric and perspective drawing systems and elements of the production system such as printing, photography, photocopying and 3D processes.